On Sunday September 4th 20 riders met at sun up for the the 1st annual TAMBA Rose to Toads Ride. Gearing up in the parking lot of the Mt Rose Tahoe Rim Trail trailhead there were high expectations for a full day of epic mountain biking. 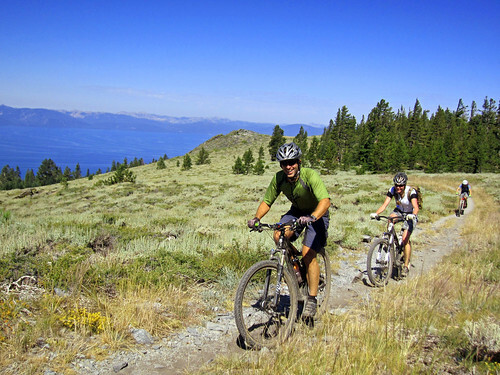 The point to point ride consists of 60+ miles of rocky, technical, and fun trails that link Tahoe’s North Shore above Reno and Incline Village to Tahoe’s South Shore ending on the famous Saxon Creek (Mr. Toads Wild Ride) Trail. The plan for most of us was to hopefully finish the epic ride before sunset. 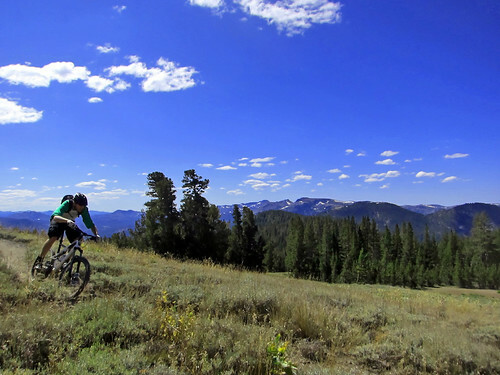 For some people 60 miles on a mountain bike doesn’t sound too bad, but when you factor in that this ride is on high Sierra singletrack with 8,000 feet of climbing and over 10,000 feet of descending, it turns out to be one brutal day. Without any fanfare we all slowly jumped on our trusty bikes and headed off onto the rolling single track through the meadow. 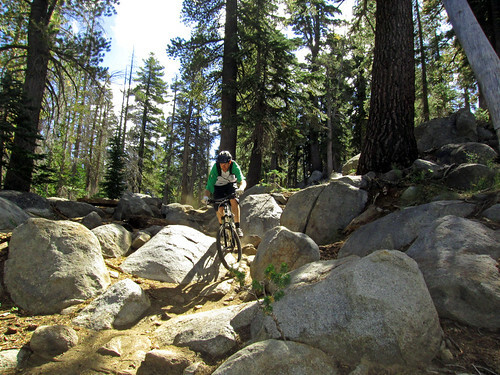 The first section of the ride starts off on 9 miles of the Tahoe Rim Trail with slightly downhill single track dotted with rocks and roots. The speed is fairly consistent around 10-14 mph, allowing you to pump through corners and float over strategically placed rocks. The Rim Trail then comes to a 4 way intersection with the old Tunnel Creek dirt road. 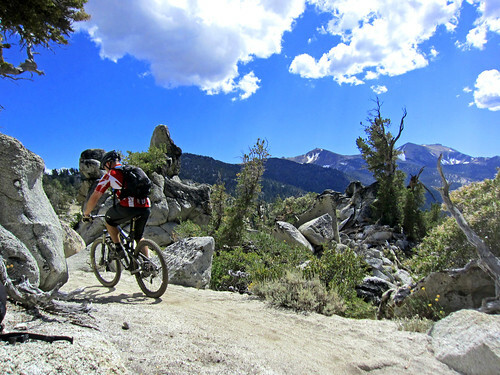 We opt to head down towards the lake and connect up to the world famous Flume Trail. Still early in the morning with the sun just coming up over the mountains to the East there are the most amazing views of Lake Tahoe down below on my right. The trail is all ours at this time of day, not one other rider was on the Flume Trail yet. After about 5 miles of smooth pedaling on the Flume trail we come to Marlett Lake and the dirt road that leads on to Spooner Lake State Park. This is where we start to see a whole hodge-podge of riders pedaling up towards the Flume Trail. 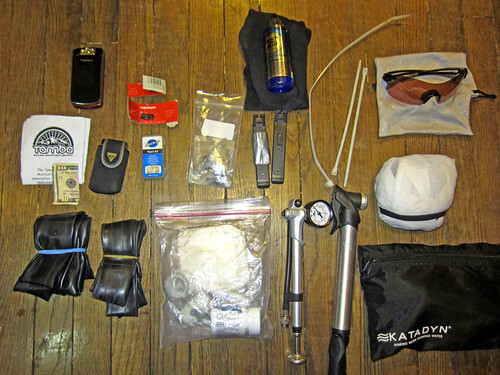 Everyone from a guy with a full size tackle box bungee corded to his handle bars, to serious looking spandex clad racer types are headed up the opposite direction. Once at Spooner Summit with 20 miles under our legs there is a false sense of confidence that the next 40 plus miles will be just as easy. 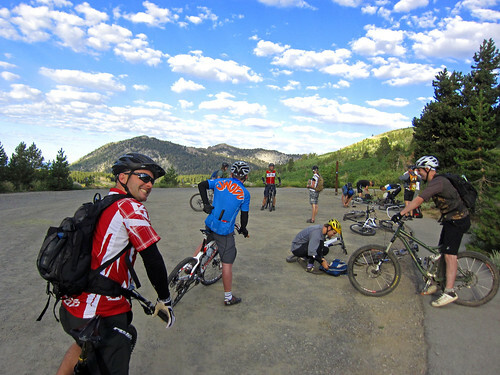 From here on, we meet back up with the Rim Trail where the real climbing and technical parts of the ride start. 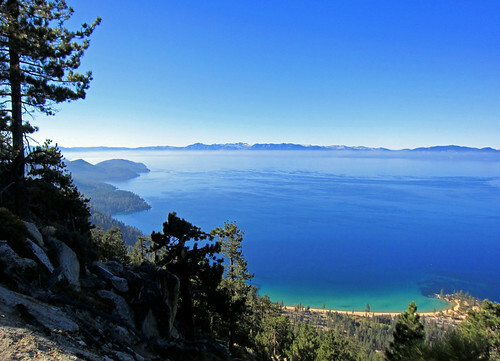 Out of Spooner there is a solid climb of about 7 miles with 1,800 vertical feet of climbing leading up to the “Bench.” Being close to 9,000 feet high we take a lengthy rest stop here gawking at full on views of Lake Tahoe nearly 3,000 feet below. We regroup with 7 other riders to take some group photos and throw a few hi-5s since we’ve made it this far together. Jumping back on the bike the real fun begins with the slight decent down from the Bench towards Kingsbury Grade, this section of trail usually feels like a flatter version of Toads to me, and when dialed in it’s as fun as any mountain biking in Tahoe. Complete attention puts me in the zone hopping over rocks, dropping small ledges and railing turns while pumping my bike to carry speed. After about 7 miles we get to the intersection of the Chinese downhill, we pedal up another 1/4 mile or so to the new section of Rim Trail just completed in 2010. Turning right here we follow the blue Rim Trail signs past Castle Rock overlook. This new 3 miles of trail is super fun to ride, scattered with skinny log rides and a few small rock features all the way to the pavement at Kingsbury Grade. Once at Kingsbury Grade there are two choices to continue on. First would be to drop down and pick up the other new section of Rim Trail on Kingsbury south that heads to the Van Sickle trail… this is a bit unnecessary and adds in some un-fun climbing while bypassing one of the best stops of the day and the only place to stock back up on snacks. So we take the logical turn and pedal up the paved road of South Benjamin over to the small market on Tramway. After regrouping with a few riders and fueling up on chocolate milk and salty peanuts it’s time to ride up to Heavenly’s Stagecoach Lodge and meet back up with the Rim Trail again. It’s always fun heading through the fabled winter playgrounds of Mott Canyon and Killebrew Canyon, remembering how this area was buried under 10 feet of snow just a few months earlier. Amazing views open up here looking straight down on the Carson Valley and ranch lands below. In some places it’s like you’re riding on the side of a 3,000 foot cliff. Onward we come to the saddle at Monument Pass – pause a bit, down some Hammer Gel and look at the huge mountains ahead still dabbled in snow that we will need to conquer soon. Knowing the highest pass is yet to come we push on, greeted by a slight flowy decent for a few miles before a small climb up to Star Lake. Personally, any time I’m at Star Lake it’s the highlight of my day, and this is no different. Star is an amazingly beautiful high alpine lake tucked into the side of a couple 11,000 foot mountains fed by pure snow melt. It’s an oasis in the sky for hikers and bikers. My buddy Jake and I pull out two cans of Cherry Coke stowed away from the market, cheers, and down the syrupy drinks before getting back on our bikes. The climb out of Star towards Freel Peak starts off fairly gentle, the soil here is littered with large chucks of bright white quartz, sometimes I think a giant gold nugget might be hiding inside the quartz, but I never see that gold. We stop at the small creek flowing across the trail and I pull out the water filter tucked in my pack. This water is freshly melted snow off the face the 11,000 foot Job’s Peak and Freel Peak above us, and it is the coldest and best tasting water around. 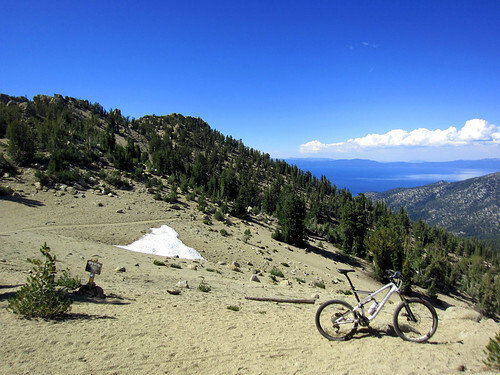 Once at the top of the climb directly below the summit of Freel we have reached the highest elevation on the entire Tahoe Rim Trail, it is 9,800 feet above sea level and the view is breath taking, literally. A quick flip to unlock my suspension and we’re all the sudden bombing down the South side of Freel, through scattered fields of wildflowers in their full September bloom. We gather at the intersection of Armstrong trail and part good-bye with more high-5s to our new friend Trevor who rode with us all day but decided to call it quits and finish his ride with a decent down Armstrong Trail and then over to Corral Trail. Jake and I take a couple more hits of Hammer gel and start up on the last and final climb of the day. After topping out over 9,000 feet again it’s all downhill from here. The 5 miles of so of Rim Trail before the intersection of Toads is fun and flowy. Vistas of Hope Valley, Kirkwood, and the Southern Sierras towards Yosemite make us pause one more time to take in the warm afternoon glow. At the intersection of Toads we see three other riders who just pushed up 40 pound downhill bikes from Luther Pass, 3 miles away. Two are wearing fullface helmets, while one guy only has a backwards baseball cap on. We trade a few words and then speed out in front of them. Suddenly we just get into the groove of the trail, popping over rocks and railing turns. My tired legs are glad there’s no more climbing and start to feel fresh again, but the calluses on my hands feel like pulsing pins twisting into my skin. We make our way through the upper rock garden, my line was pretty ugly, but then let loose riding like water all the way to the bottom. The rocky downhill sections quickly give way to the fast tight berms and rollers of the lower “Star Wars” section… then suddenly, we’re done. After 7 hours of pedaling, we’re completely exhausted but already thinking about taking on the ride again! CLICK HERE to sign up for the 2014 Rose to Toads Ride on August 30, 2014.